I was reading Arts in View, a blog, written by my friend and author, Donovan Walling. He elegantly wrote a blog about googling your own name or someone else’s as confirmation of being alive or having lived. It got me to thinking about a low tech version of that thought, what about the people who are buried in graves that are unmarked and those whose grave markers are slowly eroding? 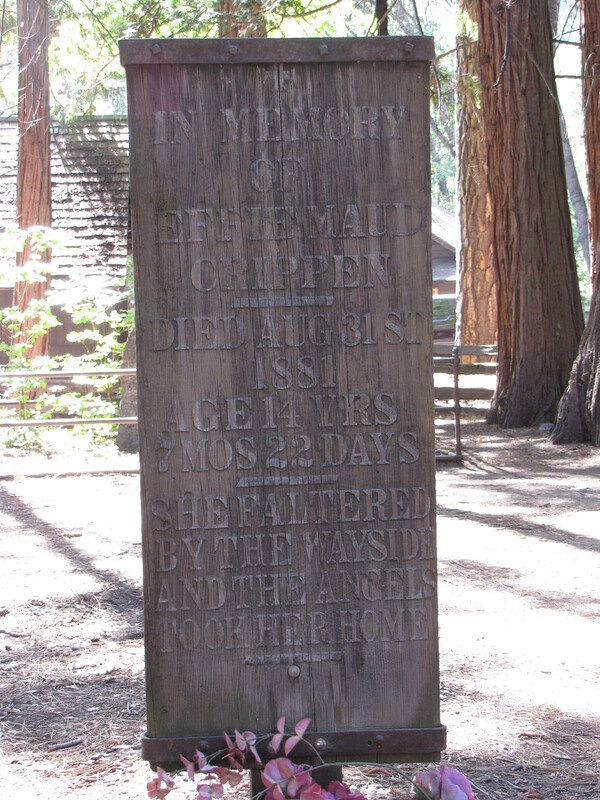 It reminded me of Effie Maud Crippen in the Yosemite Cemetery, in the Yosemite Valley of Calfornia. The wording on her wooden marker becomes more faint with each passing year. How soon before the words are gone altogether? Then what becomes of her memory? Effie Maud had suffered from a lingering illness and her frail body succumbed, her September 3, 1881, Mariposa Gazette death notice described her untimely passing, “The grim monster, Death holds an impartial respect for persons: blooming youth, as well as the aged, must yield to the sickle, and fall into the swath, which is to be gathered into the fold and gathered with others who have preceded, and those who are soon to follow.” She died and was buried the next day, followed to the grave by her family, friends, neighbors, and her classmates. Her epitaph faintly now whispers, “She faltered by the wayside and the angels took her home.” Those who were there that day she was buried are gone along with their memories of Effie. How long before the grave marker that bears witness to her life fades along with her name? Though the image of this marker may some day be completely eroded, you Mr. Rife have given dear Effie another boost towards immortality by bringing her demise and resting place to the front of minds who I can honestly say, would have never ever even heard of Ms. Maud. On her behalf….Thank you….and keep em comin!